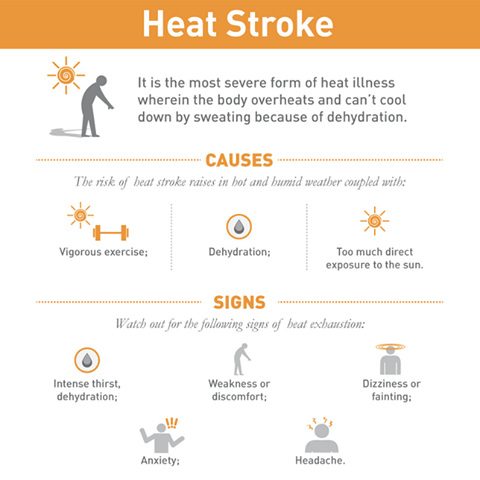 The risk of getting a heat stroke increases during hot and humid weather, especially if you are engaged in physical activity, are dehydrated, or have been directly exposed to the sun for too long. How to prevent and treat heat stroke. To assist persons suffering from a heat stroke, move them to a shady spot or indoors and have them lie down with the legs elevated. If still conscious, have them sip cool water. Remove clothing, apply cool water to the skin and fan them. Apply ice packs to the armpits, wrists, ankles, and groin. Bring them to a hospital as soon as possible.